Ulrich L. Lehner reintroduces Christians to the true God--not the polite, easygoing, divine therapist who doesn't ask much of us, but the Almighty God who is unpredictable, awe-inspiring, and demands our entire lives. Stripping away the niceties with a sling blade, Lehner shows that God is more strange and beautiful than we imagine, and wants to know and transform us in the most intimate way. 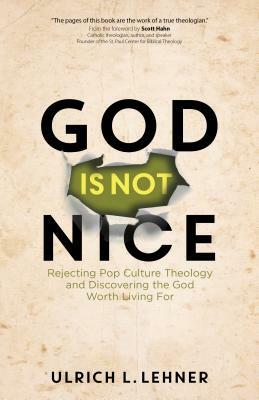 With his iconoclastic new book God Is Not Nice, Lehner, one of the most promising young Catholic theologians in America, challenges the God of popular culture and many of our churches and reintroduces the God of the Bible and traditional Christianity. As Lehner writes in the book's introduction, "We all need the vaccine of the true transforming and mysterious character of God: The God who shows up in burning bushes, speaks through donkeys, drives demons into pigs, throws Saul from his horse, and appears to St. Francis. It's only this God who has the power to challenge us, change us, and make our lives dangerous. He sweeps us into a great adventure that will make us into different people." This book is not safe. It may startle and annoy many people--including those who purport to teach and preach the Gospel, but are missing it, according to Lehner. God Is Not Nice intends to overthrow all of our popular misconceptions about God, inviting us to ask deeper questions about the nature of our lives and our relationship with him. When you're finished with God Is Not Nice, you may find the idols you constructed in God's name smashed, replaced with a God who will ask you to live an entirely different life full of hope and transformation. Ulrich L. Lehner is an internationally renowned professor of religious history and theology at Marquette University in Milwaukee, Wisconsin. He is a native of Bavaria/Germany and has earned doctorates in history and theology. Among his numerous honors are grants and fellowships from the Princeton Institute for Advanced Study, the Notre Dame Institute for Advanced Study, and the Humboldt Foundation. The author and editor of more than twenty books, Lehner received the John G. Shea Award for the best book on Catholic history in 2011 by the American Catholic Historical Association for Enlightened Monks. Since 2014, he is an elected member of the European Academy of Sciences and Arts. Lehner lives in the Milwaukee area with his wife, Angela, and their five children.Scott Hahn is a popular Catholic theologian, author, speaker, and apologist who founded the Saint Paul Center for Biblical Theology and teaches at Franciscan University of Steubenville.